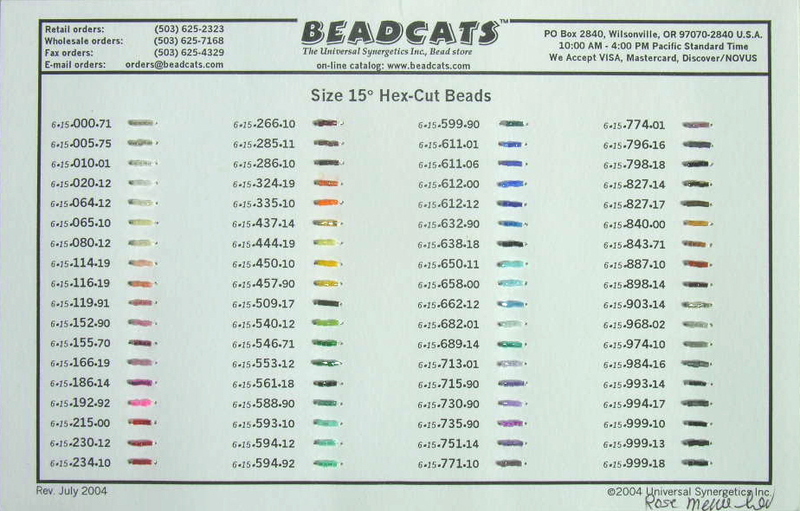 These are white cards with beads of EACH and EVERY color we have in stock sewn down next to its stock number, which you find listed in our catalog. 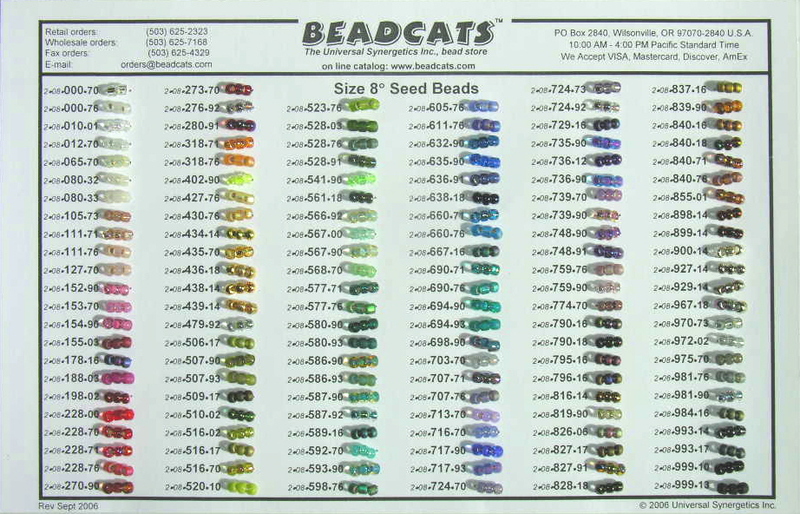 The seed bead cards have 3 or 4 beads of each color sewn down. 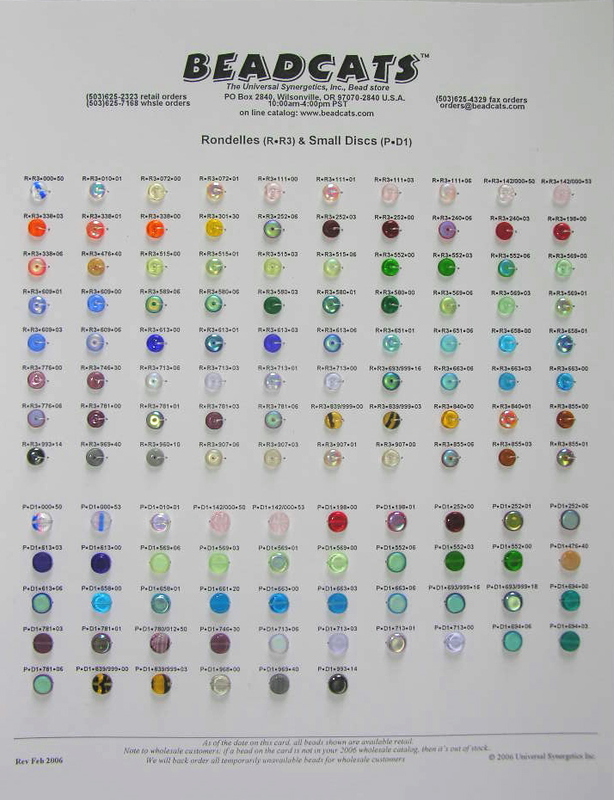 The pressed glass cards have 1 bead of each color sewn down. 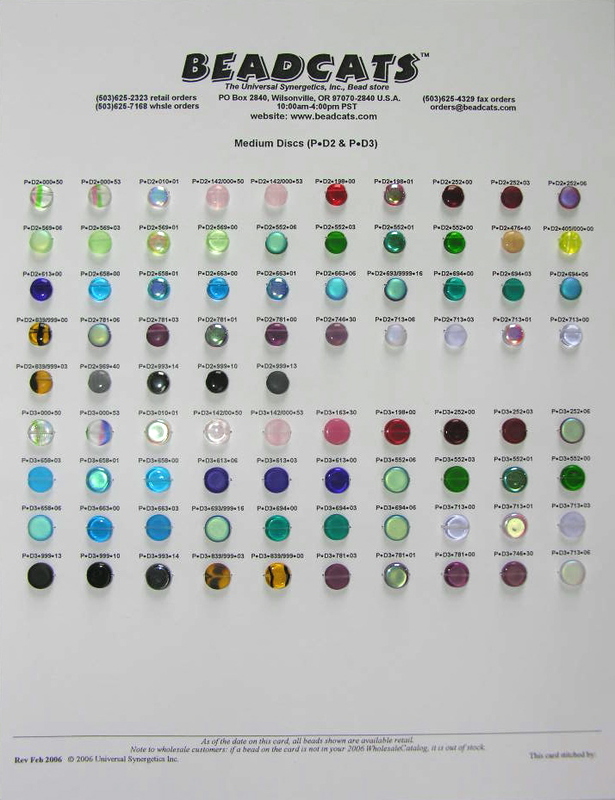 If you're a professional designer, get to know our seedbead & pressed glass color & stock# system. 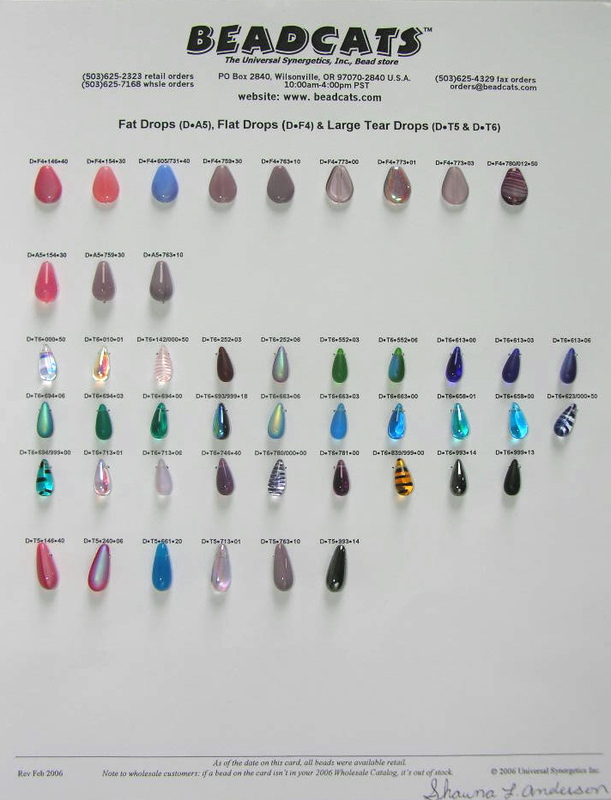 If a stock number on the card is missing from the website or catalog, we are either temporarily out of stock of that bead, the dye lot has changed, or the bead is so new that it hasn't even been posted to the website yet. 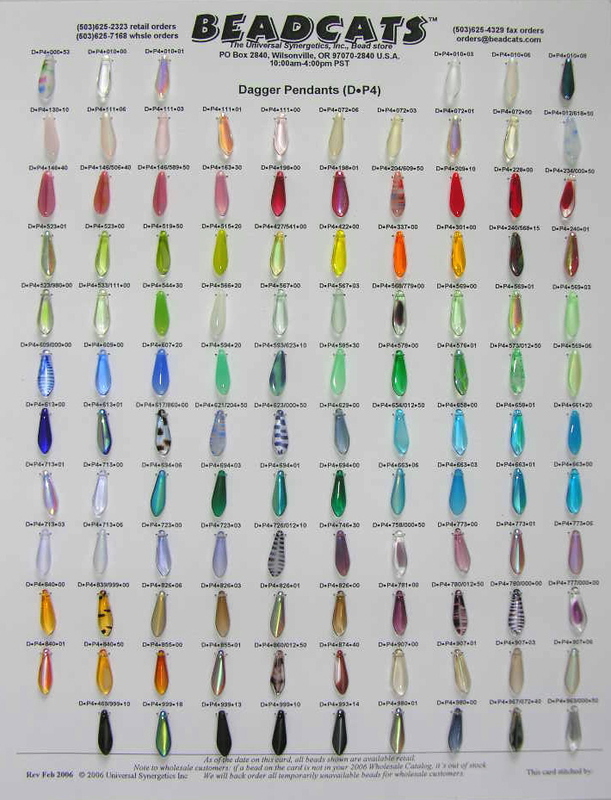 If you have an old stock#, our computer will link it to the current dye lot, and we will substitute the new color with your permission. 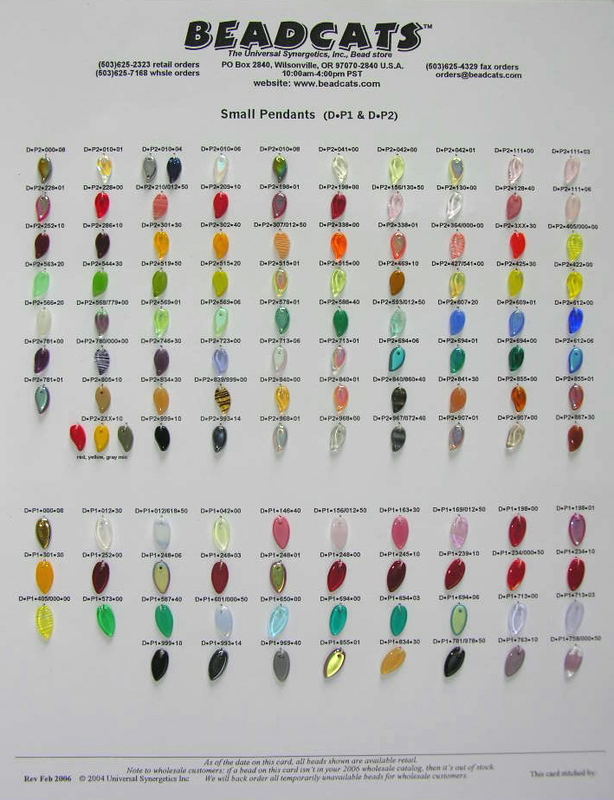 Be sure to let us know if substitutions are OK.
We do not use manufacturer's color numbers. They are unsystematic and wildly variable. We assign all our own color#s using natural daylight illumination. 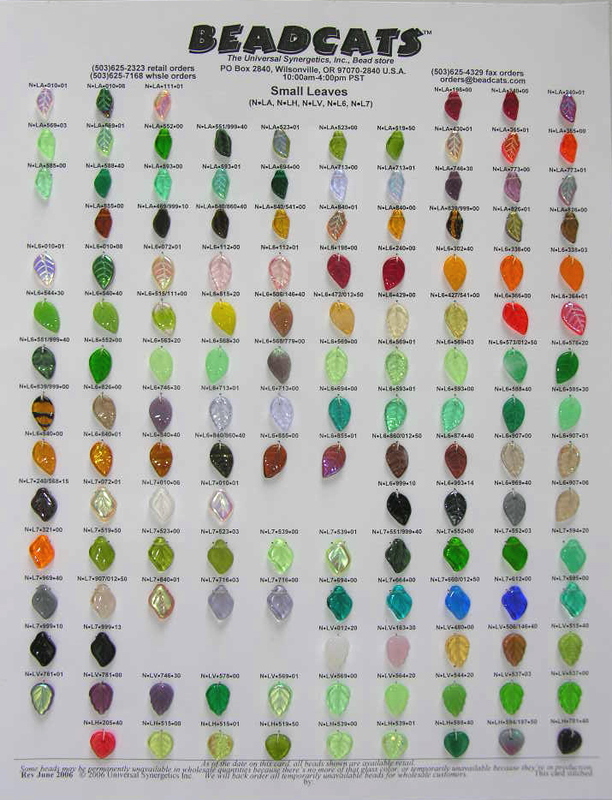 If a new glass batch is slightly lighter or darker, we adjust the color# accordingly. We're as serious about color as you want to be. 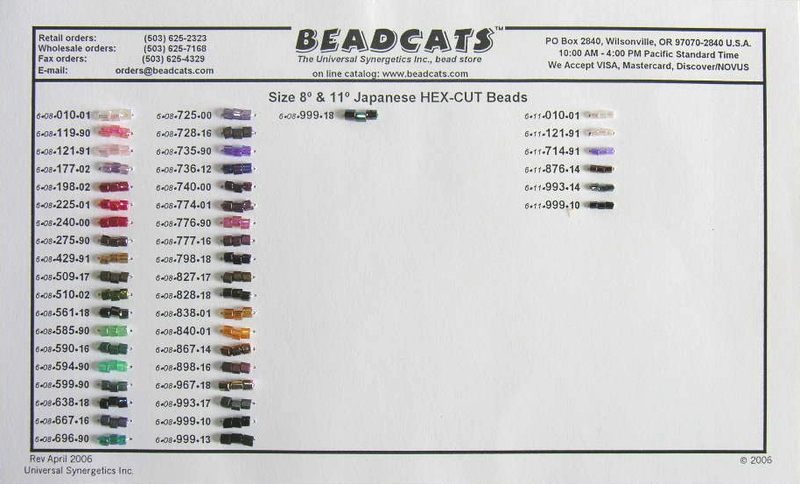 Price update: Our bead cards are sewn in the U.S. (No, we haven't outsourced them to another country.) 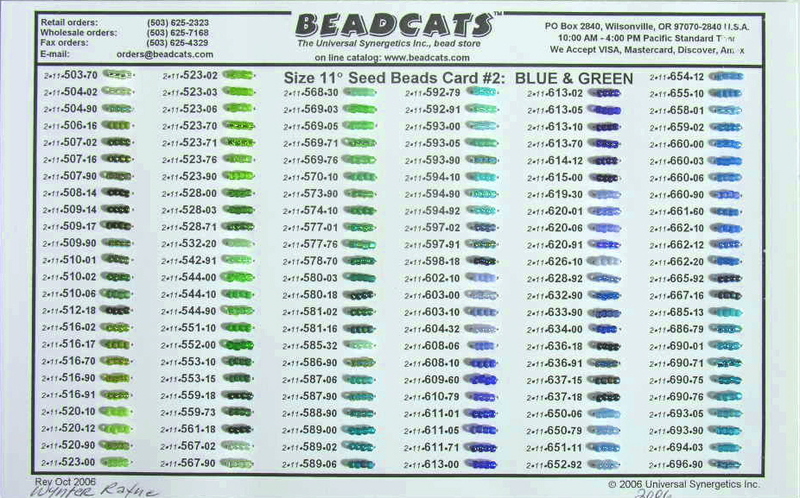 Minimum wage has increased at least $3/hour since we originally priced our seed bead cards, and the number of beads on the most of the cards has gone up dramatically. Sadly, we've had to raise some prices to reflect these increases in our actual costs. 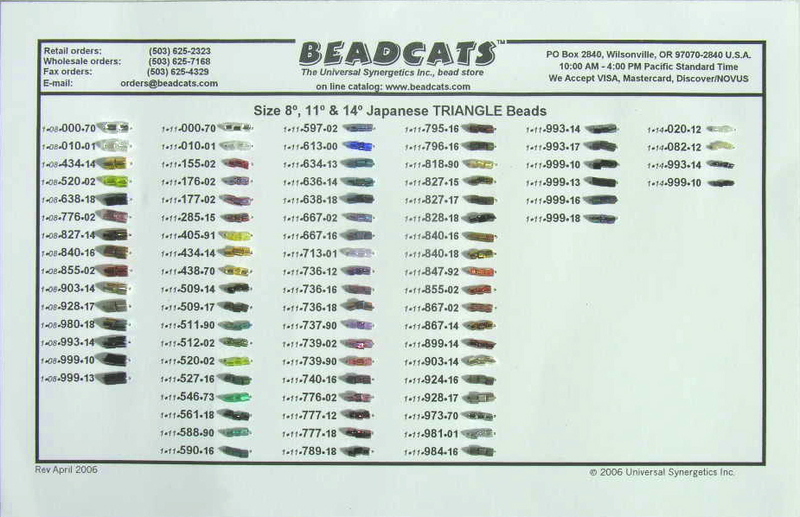 Our goal is always to sell you bead cards at exactly (or a little less than) what they actually cost us to make. 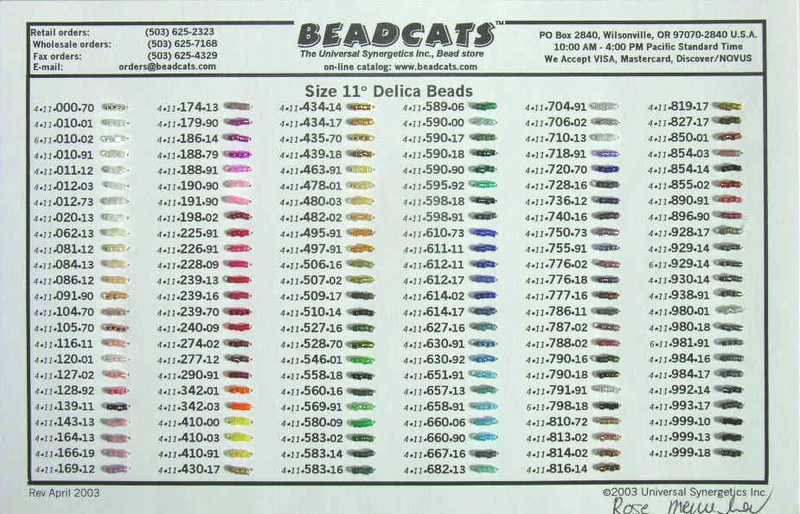 That way we can keep our bead prices reasonable. 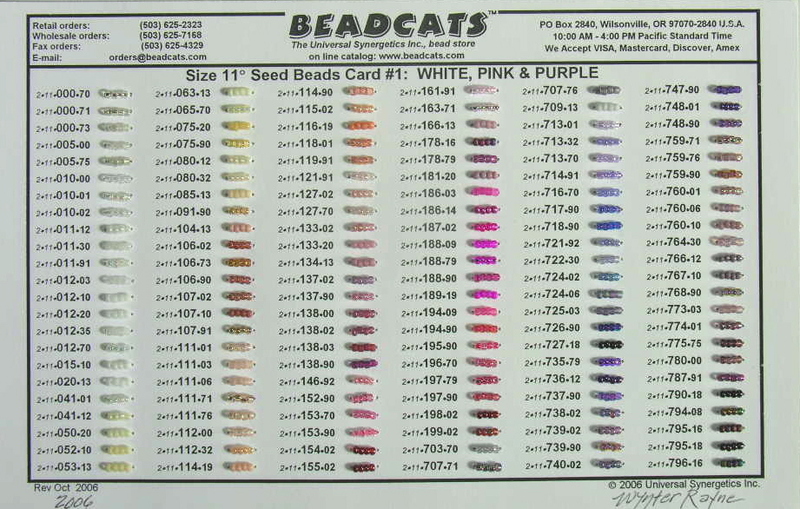 The seed bead cards are generally udpated once a year. 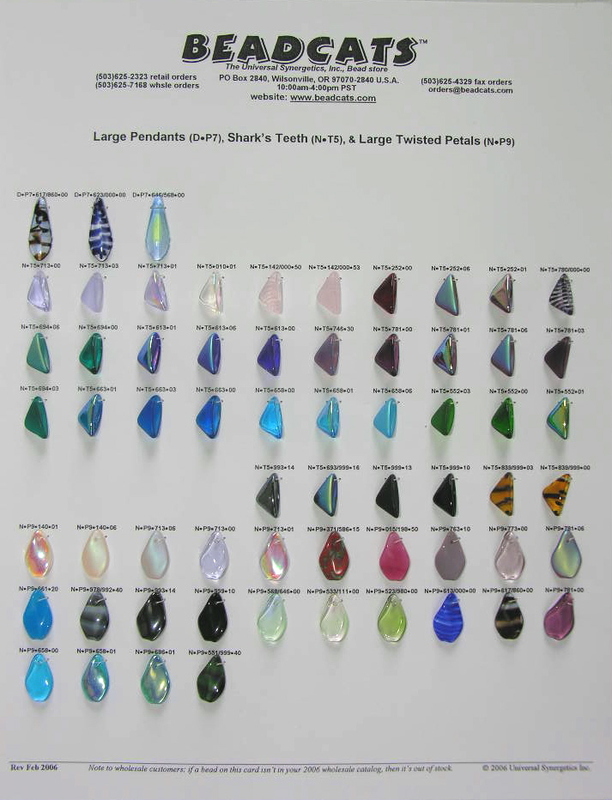 The pressed glass cards are often updated twice a year, or more often, to reflect new shipments. 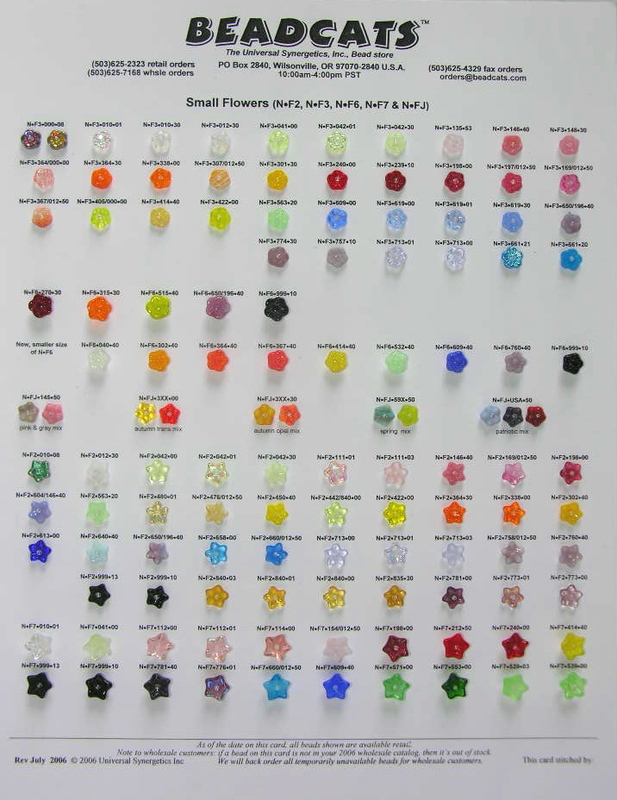 The exact number of beads on a card may vary slightly from what you see here. View individual cards by clicking on View in the table below. 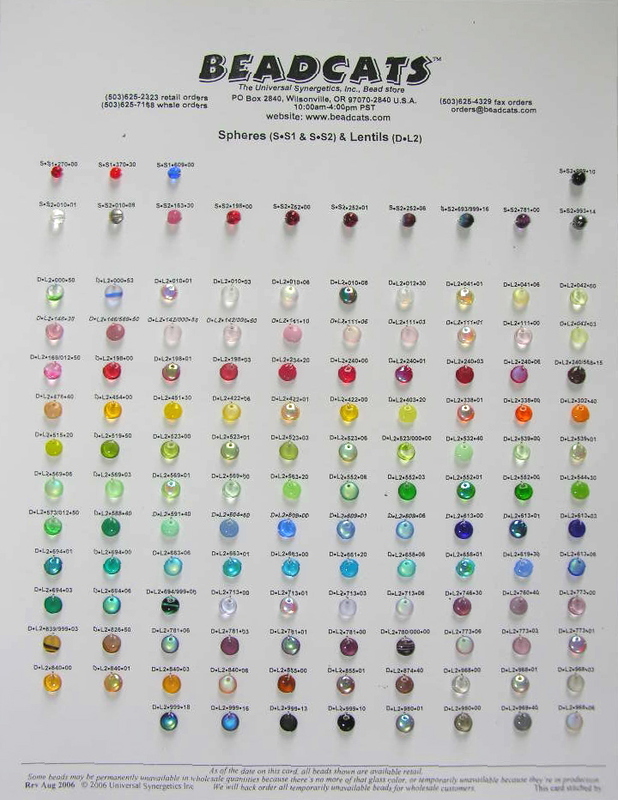 However, keep in mind that colors of beads on your monitor will most likely be somewhat different from actual colors on the beadcards. All monitors are not created equal. 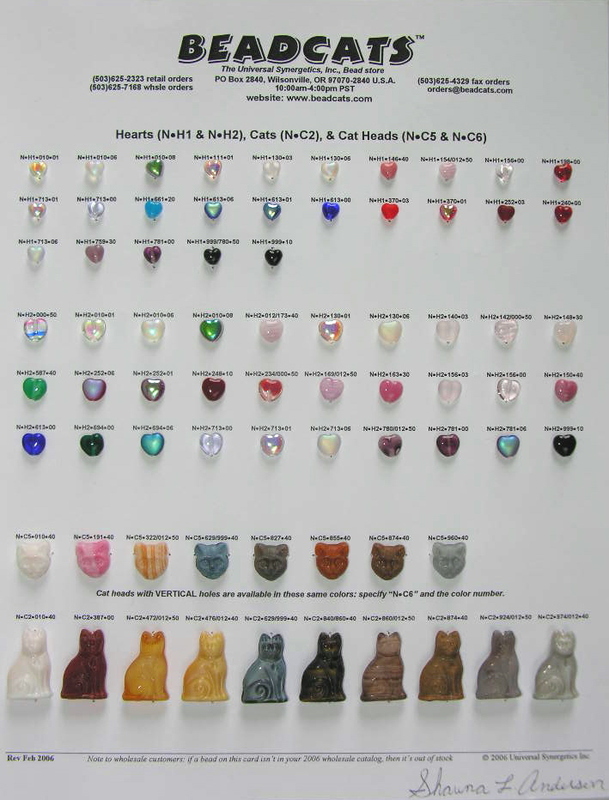 That's the reason we have beadcards. 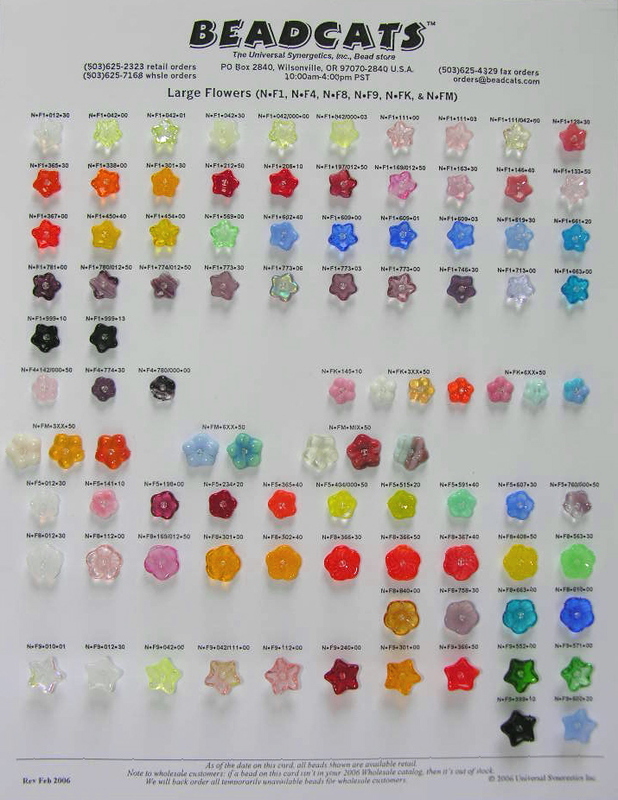 For true colors, you have to look at the beads themselves. 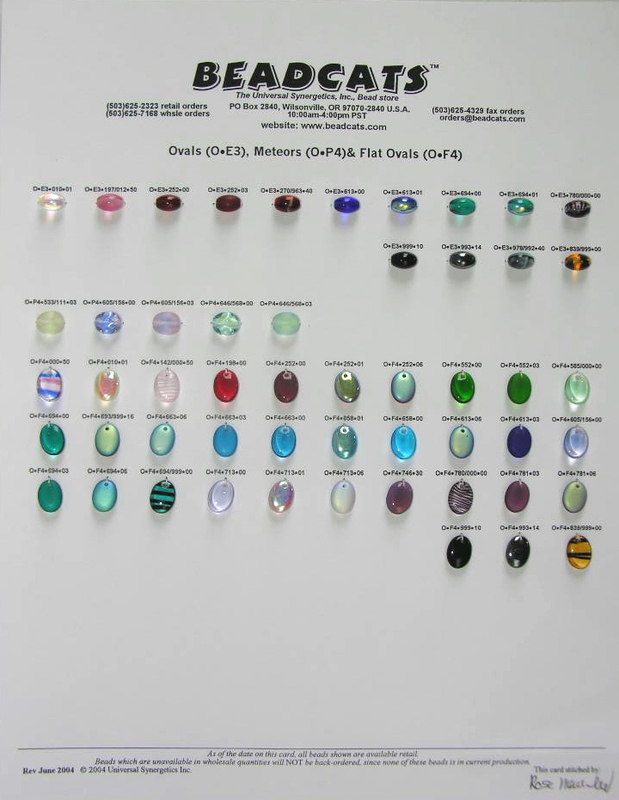 Likewise, sometimes some features of beads in the photos you View, like iridescence, or silver lining, or faceting may be less apparent than on the actual bead. 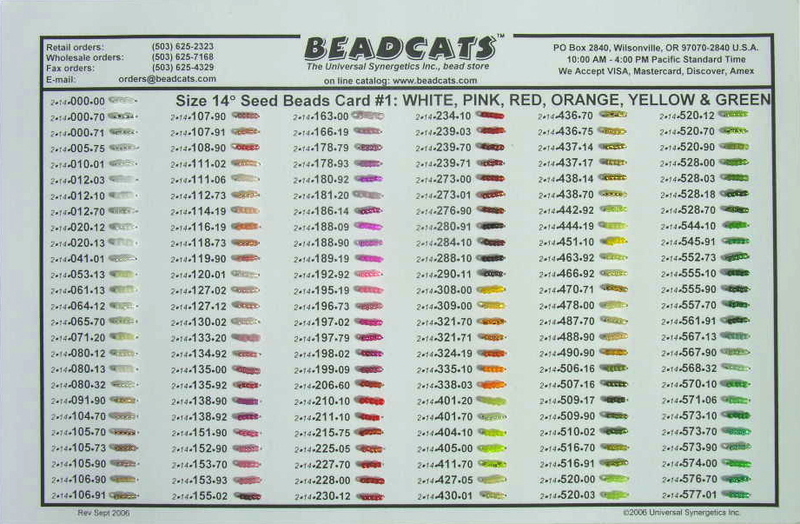 Again, that's why we recommend you keep a few of the beadcards on hand for reference. 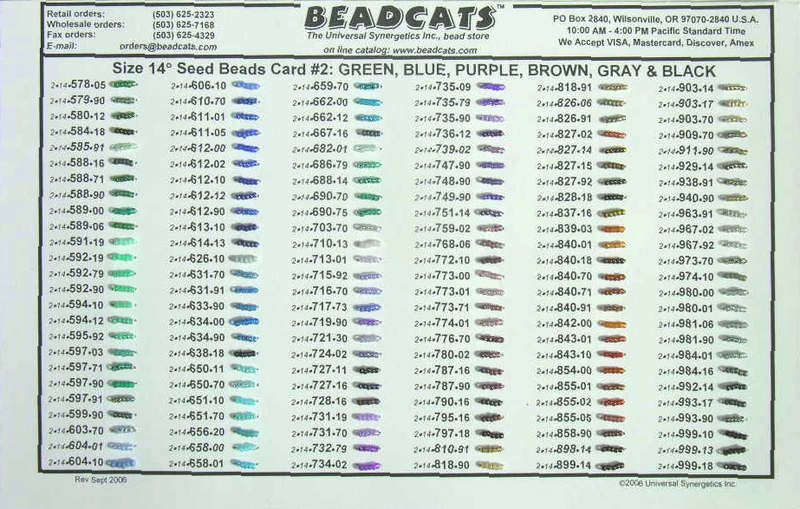 Then, even as color numbers change in future, you can still use your old cards, and numbers, to get a pretty good idea how close the colors of the new beads are to the colors of the old beads. 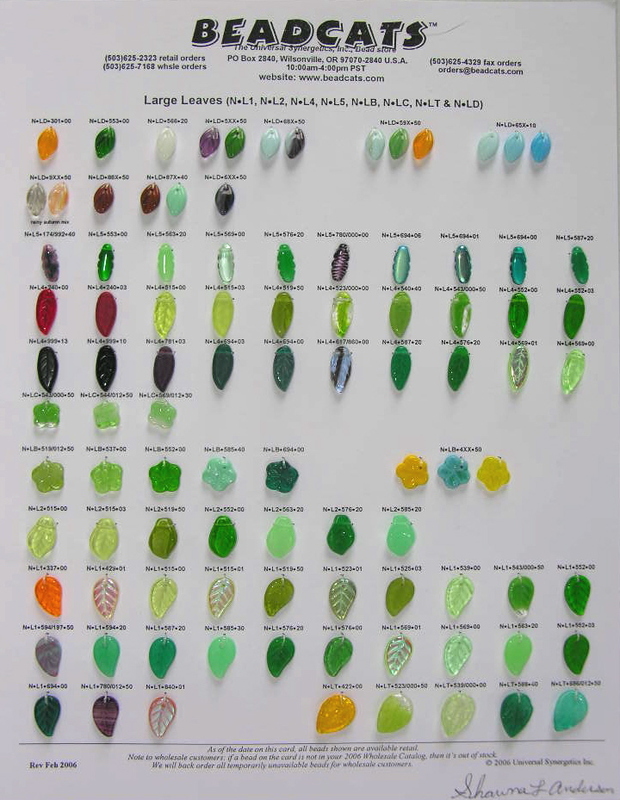 Remember, for most colors, but especially yellow, orange, pink, purple and green, it's almost impossible to consistently get the same color from every furnace batch of glass. That's why we came up with our proprietary color stock# system. 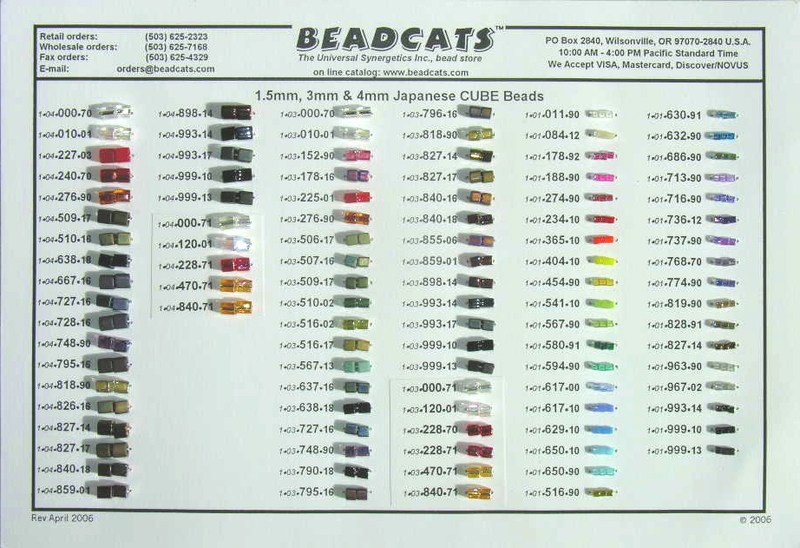 Learn how to use it with your beadcards and you'll always be able to reference a new color, even if it isn't on your 15 year old beadcard. 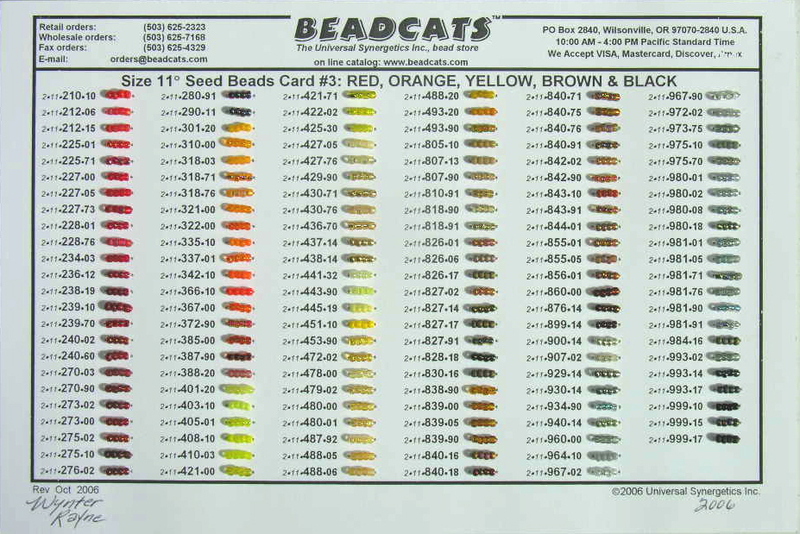 Bead colors on the cards give you a very realistic picture of the true color of the bead. 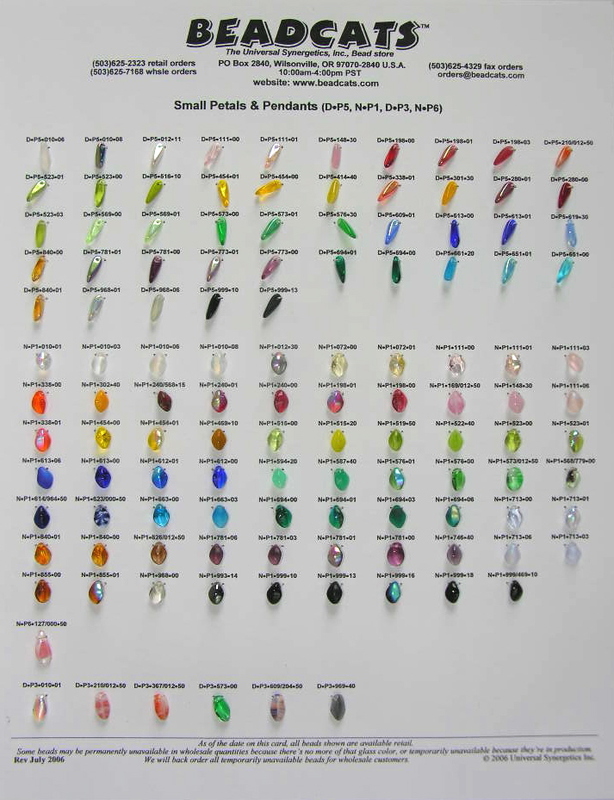 Bead colors often look more intense, or appealing, in hanks or bags, but the color on the card is much closer to how the beads will look when used in a pattern. 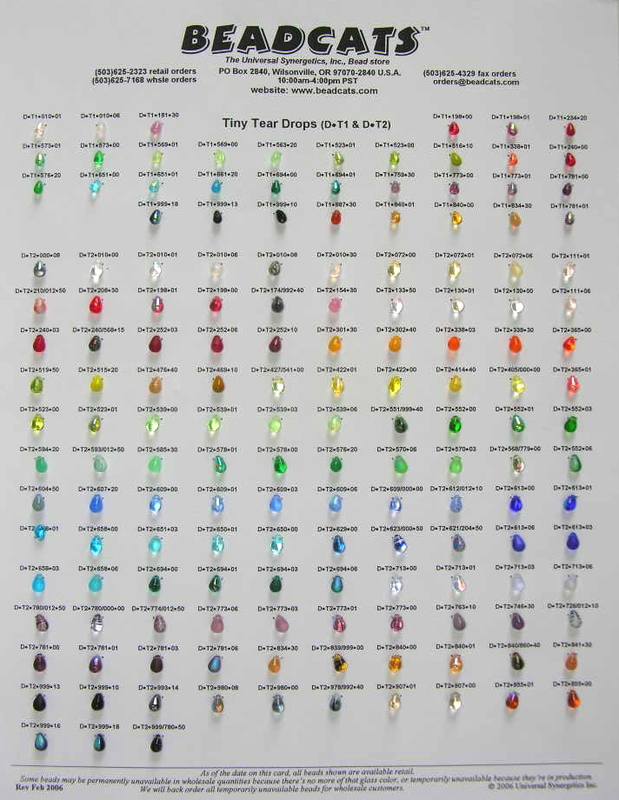 If you look closely, you can also tell how regular the different beads are, and which colors tend to be a little larger or smaller. 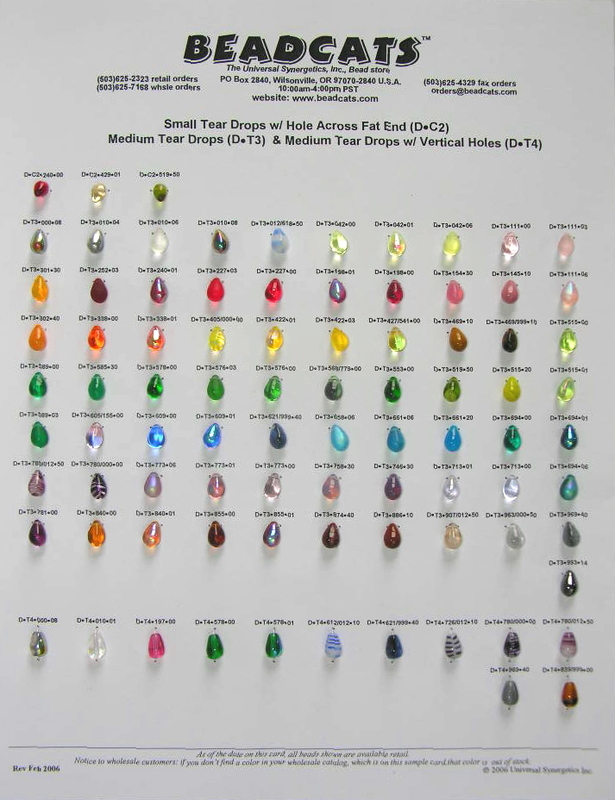 It can be very difficult to tell this just from beads in a bag or tube, unless the beads are an opaque color.